Today is an exciting day! My Sew Tiny Sampler pattern, a foundation paper piecing pattern that includes foundation templates for 16 of the most-oft used blocks from my 100 Days of Sew Smaller project, is now available for purchase from my Payhip shop. During my 100 Days of Sew Smaller project, quite a few people asked about the patterns I was using to make my tiny blocks. Many of my blocks were based upon well-loved traditional blocks, but I created foundation paper piecing templates in Inkscape as I went along. After many requests, I’m happy to finally be able to make the templates and pattern available publicly. The pattern includes foundation templates for the 16 blocks shown on the cover, plus assembly instructions for putting them all together into a mini mini sampler that finishes at a whopping 7 1/2″ square. Each block measures 1 1/4″ square finished, and 1 3/4″ unfinished. The pattern includes tips on tiny piecing in general, links to resources on foundation paper piecing (FPP) basics and using fussy cutting in your FPP blocks, as well as a long list of project ideas for your tiny blocks. To help conserve paper when making LOTS of blocks, I also included bulk printing pages for each block design. I had fun playing with Quantum fabric by Giucy Giuce for Andover Fabrics for my cover blocks, and of course used meticulous cutting in every possible location. I stitched all of the blocks using 50wt Aurifil thread in 2600-Dove, which is pretty much always in my machine for piecing. I highly recommend reading my tutorial HERE and using the fussy cutting FPP tips in your tiny blocks. As you can see, it really adds a special touch! I’m looking forward to seeing all of the tiny blocks created by all of you, and will be sharing some of the blocks some of my friends are making to help celebrate the pattern release soon. In the meantime, you can head over and read about Yvonne’s blocks and what she made out of them here, or check out the hashtag #sewtinysampler on Instagram to witness the miniaturization of March. Head over and get your Sew Tiny Sampler pattern here to join the fun. I can’t wait to see what block you make first!! Today I’m excited to reveal the block I designed for the Splendid Sampler 2 book: Adventure Abounds, found on page 122. Those of you who know me are most likely not surprised by this block one bit! For those of you who are new, welcome! 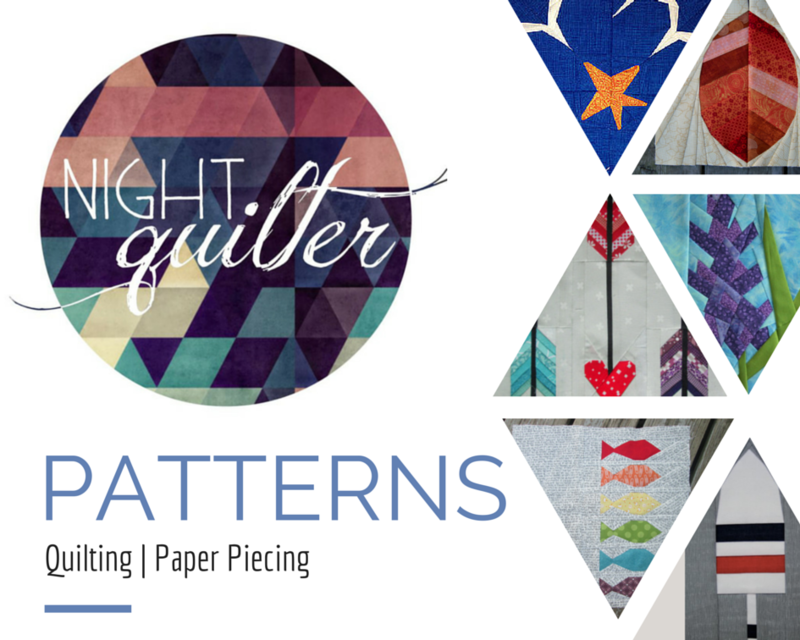 I’m Kitty Wilkin, aka Night Quilter, and I’m so glad you’re here! I am a full time mom of three kiddos in rural Maine, but I’m also a pattern designer (EPP, FPP, traditional piecing–I love it all! ), quilt and product photographer, teacher, social media manager for the Quilter’s Planner, AND an avid fussy cutter, which I prefer to call meticulous cutting. I’m often inspired by the natural world around me, and when Pat and Jane asked me to design a block reflecting my best quilty life, I knew it had to include family adventures in nature tied together through the creation of a quilt. With strong influence from my Summer Adventure quilt pattern, this block has a bit of everything–sea, trees, and lots of love! If you’re new to the Splendid Sampler books curated by Pat Sloan and Jane Davidson, find out more about the Splendid Sampler 2 book and sew along HERE. Today I am going to share 3 tips for using fussy cutting in foundation paper pieced blocks, using my Adventure Abounds block from the Splendid Sampler 2 book. If you’re new to foundation paper piecing (FPP), read my beginner basics FPP tutorial HERE first to make sure you know all of the key components and basic tips. Then let’s dive in! There are a few things you should remember before beginning FPP: First, the templates are a mirror image of the finished block, so when planning your fabric placement, visualize the right side of your fabric on the back of the template. Second, I highly recommend color coding your paper templates before starting so that you know exactly where each fabric should be. Third, don’t forget to use paper scissors to cut out and trim the templates! Your fabric scissors don’t want to go there! One of the easiest ways to use fussy cutting with FPP is to position your fussy cut fabric on the very first piece placed. With this method, simply hold your fabric up to a light source on the wrong side of the paper template, aligning the fabric motif you want to feature. Use a little dab of washable glue stick to hold it in place, and then continue piecing the rest of the block as you normally would. Your fussy cut can be perfectly positioned with very little effort. Depending on the block you’re creating, even this little use of fussy cutting can create quite an impact. As an example of this for my Adventure Abounds block, I decided to position a subtle bird in the sky above the ocean, and held it up to a window to make sure it was positioned exactly how I wanted it. With a white on white background for my blocks, this example is subtle, but sometimes those subtle details are my favorite! Another way to make fussy cutting a bit easier while foundation paper piecing is to create a template for the pieces you wish to meticulously cut. You can use template plastic for this, or can even repurpose clear plastic lids to food containers. You want to use something that you can see through or at least trace through using a light source. To create a template, first trace the shape from the paper foundation template onto the plastic. Be sure to label your piece, AND make note of directionality since the paper template is a mirror image. Once I trace the shape, I flip over the template plastic and write my notes on the opposite side, so that when I cut the fabric for that piece, I know that my notes should be legible on the right side of the fabric. Next, using a quilting ruler with 1/4″ measure, draw seam lines 1/4″ outside all the edges of your drawn lines. Cut out the template along that seam allowance line. Repeat for all of the shapes you want to fussy cut. You can use the clear templates to be sure you’re cutting your fabric piece exactly as you want it. Note that you will want to use all of the tips outlined in this tutorial when piecing so that the perfectly cut piece of fabric gets sewn in exactly how you want it. For my block, I decided to fussy cut the heart so that the fabrics for the two pieces of the heart look continuous despite consisting of two fabric pieces. I decided to make a third reference template of the full heart and traced the pattern from the fabric onto the template, which I used as a reference when cutting out each individual part. Once you have your template positioned over the exact motif you want, carefully trace around the template with a fabric marking tool and cut out the fabric, or very carefully use a rotary cutter to cut around the template. Note that with planning templates made with template plastic or repurposed food lids, using your rotary cutter contains a good level of danger–so either purposefully live on the wild side, or use the trace and cut-with-scissors method! Your perfectly planned fabric piece is ready to carefully stitch onto your growing foundation paper pieced section. Because this piecing is quite meticulous, you’ll want to be sure to align this next piece perfectly before stitching. Folding along the seam on which you are about to stitch and trimming the overhanging fabric to 1/4″ will help you line up the next piece accurately. You can also fold over the piece you are about to stitch along the seam line to see how it looks before actually stitching. Note that meticulous cutting is exactly that–meticulous. Be sure to be meticulous in all phases of this process to get the best results. Also, be gentle with yourself. This is not easy! Use a stitch length that you are comfortable ripping out if needed to get those first fabrics lined up. I give myself a Rule of 3 when stitching any block: I’m allowed to use my seam ripper to rip out progress and make it align better 3 times during the stitching process for any block. Once I hit my 3 times, I need to just accept the imperfections and move on. We are human, after all. But don’t be afraid to try! As with anything, the more you practice, the easier it will get. Once your fussy cut pieces are cut and stitched as desired, continue piecing your non-fussy cut pieces as you would any other FPP block. A third tool to use while fussy cutting in FPP is to pay close attention to the edge of the motif you want to feature. This works particularly well for lining up directional prints along the seam line, or for less precise fussy cuts. This method is used for any piece AFTER the first piece placed. If your fussy cut is the first piece, use Tip 1! In the Adventure Abounds block I made for the original Splendid Sampler 2 quilt, I used this tip when piecing the text on the tree, specifically the word “love”, since the word “listen” was the first piece placed, and was therefore easy to simply glue in place and piece around. Knowing that I wanted the top of the word love to be juuust below that darker top piece, when I cut the square of fabric I carefully cut just a tad bit more than 1/4″ from that top edge of the word love. I left the rest of the rectangle of fabric a bit larger and less specific, since as long as that edge lined up properly, the rest didn’t matter. With the Adventure Abounds block I’m making for my own Splendid Sampler 2 quilt, I am not using as finicky or directional of fabric for the tree, so there is no need for fussy cutting. However, I wanted to control the directionality of the fabric in a few of the waves, so that the dots on the Cotton and Steel basics and the wavy paths on the bike path fabric by Alison Glass ran parallel to the seam line. The piece is not the first one placed, so I couldn’t use Tip 1. All I want to control is the directionality of the fabric, so making a template seems like more work than is necessary. Enter Tip 3: Focus on the joining seam. Whenever employing any type of meticulous cutting in your FPP, it’s always a good idea to trim your 1/4″ seam allowance before positioning and stitching your fussy cut shape. To do this, simply fold back the foundation paper along the line you are about to sew on, and using a quilting ruler with 1/4″ measure, trim the fabric 1/4″ away from the fold. (Obviously use a cutting mat underneath! This photo shows without the mat for aesthetic consistency). Once your fabric is trimmed, you have a clean line with which to line up your next meticulously placed piece. This also helps facilitate another key FPP tip, which I originally learned from Lee Heinrich of Freshly Pieced, and which has saved me countless brain-scruntches trying to be sure a fabric piece would align properly on wonky angles in FPP. When your paper is folded along the seam-to-be-sewn, you can place it on your next fabric (right side up) and the paper shape as folded will be exactly on top of the fabric that will end up in that space once you sew along the line. Be sure to visit Lee’s tutorial for a perfectly clear and in depth explanation–it’s truly life changing when it comes to FPP! What that means for us is that with that clear 1/4″ seam line showing us the direction we want our print to go, simply lining up the folded seam line with the directional print will ensure the pattern runs in exactly the direction we want. Fold up the edge a bit to peek under and make sure the pattern is positioned the way you want it, then without changing the position of the fabric, fold the paper back up and sew along the line. You will end up with your directional fabric meticulously positioned along the seam line, just how you wanted it. Paired with that fun bird flying over the ocean that we placed using Tip 1, these tips can help take your foundation paper piecing blocks to a whole new, intentional level. Here’s the block I made for my slowly growing Splendid Sampler 2 quilt, about which I’ll show you more soon! I’m creating monochromatic blocks and using an alternate rainbow layout I sketched out in my Quilter’s Planner. This Adventure Abounds block will be positioned in the teal row, but as you can see, it is transitioning to the green. I made a compromise from my monochromatic-rule for this block, since I make the rules around here anyway! ha! Okay, just one peek at my planned layout and a few of my blocks so far. A full look will come in its own blog post soon, so be sure to follow this space! Thank you so much for joining me today–I hope this tutorial is helpful and entices some new fussy cutters to try adding some meticulous cutting to their foundation paper piecing! Please show me what you’re making and either comment with a photo, or tag me on social media @nightquilter . Most of all, have fun!! If you’re sewing along with the Splendid Sampler 2 excitement, be sure to head over to the Splendid Sampler website, and post your completed Adventure Abounds block. There is a fun Martingale book giveaway for one lucky person picked from the blocks shared on their website. Have fun with your Adventure Abounds block, and may your adventures abound!